Firefighters, police officers and other first responders know how to manage many different types of emergencies, but they may not always be prepared to handle infectious diseases or biohazards like virus cultures and pathology specimens. Enter Bob Ellis, Colorado State University biosafety director and professor in the Department of Microbiology, Immunology and Pathology. He and his team were recently selected to join a five-state infectious disease training partnership led by Duke University. 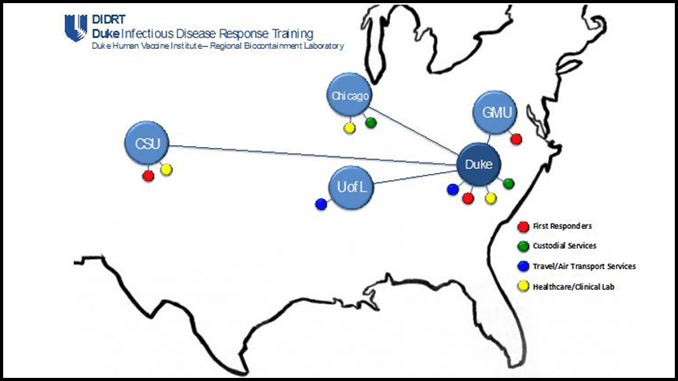 The Duke Infectious Disease Response Training (DIDRT) five-state consortium is funded by the NIH/NIEHS Worker Training Program (WTP) to address these weaknesses and contribute to a nationwide network for Ebola biosafety and infectious disease response training. Through its network of five training sites (Duke University, Colorado State University, The University of Chicago, George Mason University, and University of Louisville) the DIDRT program consortium provides training in occupational settings that carry the potential for increased exposure to contaminated materials or infected individuals with a focus on hands-on learning and a train-the-trainer model. “We will train first responders and health-care workers on how to recognize and handle biological threats, and who to call if they need help,” Ellis explained. Other universities will train janitors, airport baggage screeners and Transportation Security Administration workers. The CSU team will work with first responders of northern Colorado and southeastern Wyoming to identify those who would benefit from the training. Training sessions will be held on CSU’s Foothills campus and in other settings designed to recreate realistic scenarios. The program will emphasize adult learning principles, including active participation and hands-on activities, and will include mock emergency response scenarios that may occur in the work environment. Ellis and his team will also cover how to handle emergencies or fires in private laboratories. Scott Alderman, program manager for the consortium and director of Safety and Regional Biocontainment Laboratory Operations at the Duke Human Vaccine Institute, said CSU was selected for its nationally known biosafety program. “The partnerships and trust that Dr. Ellis has already established with health-care and first responder professionals in the Colorado area will be a tremendous asset for the consortium,” he said. Colorado State University has a training facility in the Research Innovation Center designed to simulate the conditions in Biosafety Level-2 and Biosafety Level-3 laboratories. Groups can request a tour of the facility by contacting Heather Blair in CSU’s Biosafety Office.